Hydraulic twin-circuit brake system with front axle/ rear axle circuit division. 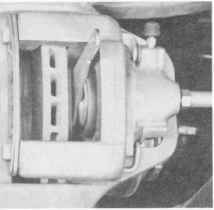 Vacuum booster, internally vented brake discs with four-piston fixed caliper on front and rear axles. 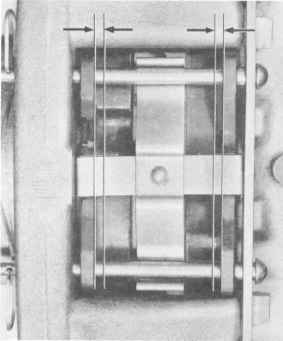 The pushrod circuit is assigned to the front wheels. ABS standard. Thickness tolerance of brake disc max. Runout of brake disc max. Runout of wheel hub max. Runout of brake disc when fitted max. Surface roughness of brake disc after machining max. * The brake disc must only be machined symmetrically, i.e. by a uniform amount on both sides. 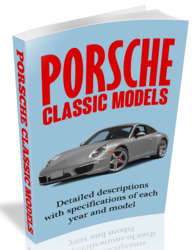 ** provided normally by preset air gap in brake booster if no support is provided for operating brake lever. AM brake pads on one axle must be replaced when "brake pad" indicator comes on, however at latest when pad thickness is worn to 2 mm. If the indicator lamp reports the brake pad wear, the warning contact (sensor plus wire and plug) must also be replaced. 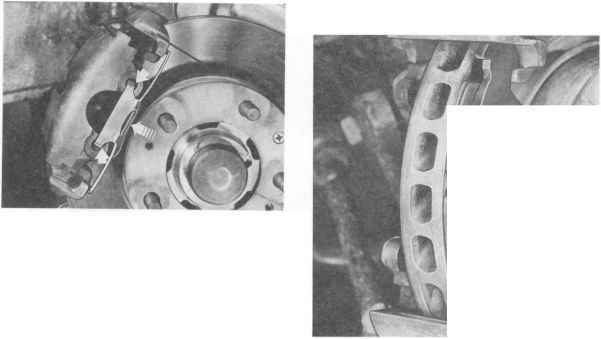 The complicated and expensive replacement of the warning contact can be avoided by replacing the brake pads at the latest when thickness is 4 mm (or 2.5 mm for version described below). This will depend on the location of the warning contact in the brake pad. The pad end take-up bore has been moved 1.5 mm in direction of the pad backplate as from April of 1982. Tolerances on the warning contact have also been limited. The warning contacts must be replaced when the core of the wire has been ground. Replacement is not necessary when only the plastic part of the warning contact has been ground. 1. Remove wheels to check the brake pads. 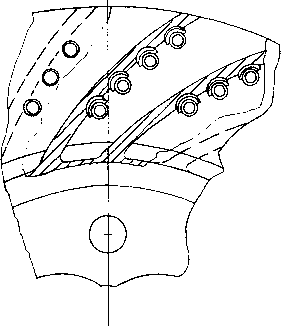 2, Visually inspect brake pads for wear. 3. Visually inspect pads of floating frame disc brakes through opening of housing (frame). If brake pads can be re-used, mark them for reassembly when removing. Pads must not be moved from outside to inside and vice versa or from right to left wheels. This would cause uneven braking effect. 1. Pull warning contact out of pad plate. Replace warning contacts when core of wire has been ground through or down. The warning contact can still be used when plastic part of warning contact has traces of wear. 2. Remove spring lock or lock wire with wire guide plate from retaining pins. 4. Remove inner brake pad with a pulling hook or impact puller. 5. Pull out outer brake pad. This requires pressing out floating caliper frame until brake pad protrudes out of pin on floating caliper frame. 1. Replace brake pads, which show deep cracks, have become loose from backplate or are covered with oil. Also in this case replace ail four pads of one axle. Brake pads with different friction values are installed depending on version. Make sure that all four wheels have brake pads of same type to correspond with brake caliper combination. 2. Press back piston to initial position with a special tool. To prevent brake fluid tank from overflowing, draw off small amount of brake fluid before pressing back piston. Use syringe reserved exclusively for brake fluids. Brake fluids are poisonous and must not be syphoned off through a hose. 3. 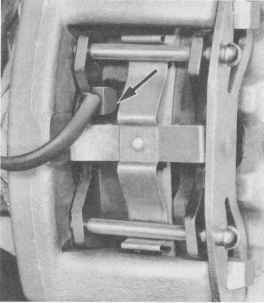 Clean bearing and guiding surfaces of brake pads in brake calipers with gasoline or a cylindrical brush. Never use solutions containing mineral oil or sharp edged metal tools. 4. Check 20° piston position and if necessary adjust with piston turning pliers. 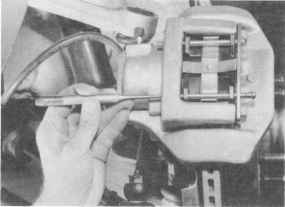 Hold piston gauge at bottom guide surface on front brake caliper. 5. Insert outer brake pad and press floating caliper frame in direction of brake disc so far, that pin engages in groove of pad backplate. To prevent seizure of brake pads in brake calipers due to corrosion, apply a thin coat of grease on bearing and guiding surfaces. Use Optimoly HT (copper paste) or Plastilube. 6. Insert inner brake pad. 7. Install cross spring, retaining pins and spring lock or lock wire with wire guide plate. 8. Press warning contact into pad in correct position. 9. 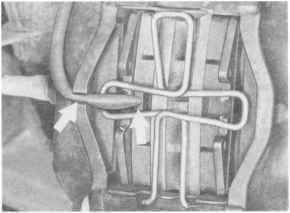 Depress brake pedal of stationary car hard several times to move brake pads to their normal operating position. Now check level of brake fluid in tank, adding more if necessary. Brand-new brake pads have a once only loss of braking effect (thermal fading), which disappears after a breaking-in time of about 200 km (125 mi.). During this period full stops from top speeds should be limited to emergency situations. New pads must be bedded in by applying medium forces to brake pedal and at larger intervals. Brake pads will first provide maximum braking effect after being bedded in. 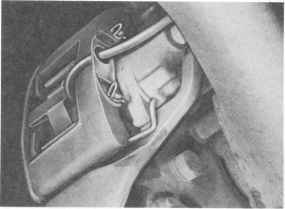 Hold piston gauge at top guide surface on rear brake caliper. When brake pads can be used again, they must be installed on same wheel (otherwise non-uniform braking effect). 1. Pull warning contact (wear sensor) out of inner pad plate. Replace warning contacts with ground through or down wire cores. Warning contacts can still be used when only plastic parts of warning contact have traces of wear. 6. 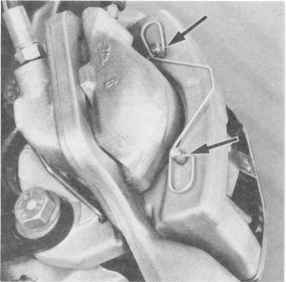 Lay housing (fist) aside and suspend from suitable point on car with a piece of wire. Remove outer brake pad from holder. 3. Remove any dirt on guide prns between holder and housing. 4, Pull plugs out of guide sleeves. Unscrew guide pins with a 7 mm socket wrench and pull out of guide sleeves. 2. Remove housing retaining spring. This requires applying pressure in center (large arrow) of spring until it disengages in the housing bores. Then remove spring toward outside at same time without applying force. Never bend spring by applying force. 5. Pull housing toward outside of car by hand to push back the piston slightly. Then remove the housing. Pull piston end brake pad out of piston. 1. Push back piston completely with special tool. 3. Check 20° piston position and adjust with special piston pliers, if necessary. 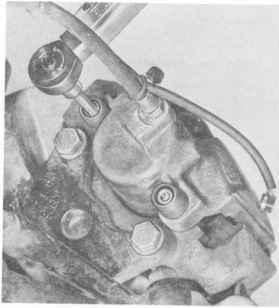 Stepped surface of piston faces down toward brake disc inlet side. Edge on bottom of housing (see arrow) can be used as a reference point. To prevent brake fluid from being forced out of tank, it might be necessary to drain some of the brake fluid prior to pushing back the piston. Use a syringe for this work, which is reserved exclusively for brake fluid. Brake fluid is poisonous and must never be sucked out through a hose. 2. Clean pad guiding surfaces in housing and holder. Never use sharp-edged tools or cleaning solutions with mineral oil content. Check seals, caps, guide pins, guide sleeves as well as housing retaining springs and brake pads for damage, replacing if necessary. Watch pairing of brake pads for front/rear axles. 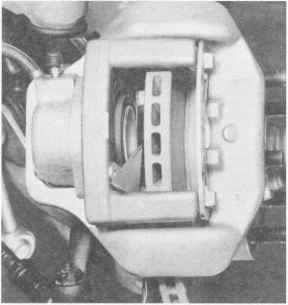 Two types of brake pads are used on the rear axle. Rear axle pads for pairing floating frame caliper disc brakes on all wheels. 4. 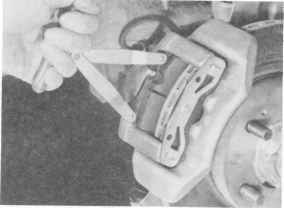 Push brake pad with riveted retaining clip into piston and place second pad on outside of holder's guiding surface on brake disc. Place housing over brake disc and brake pad, screw in guide pins with a 7 mm socket wrench and tighten to specified torque. To prevent seizure of brake pads in brake calipers due to corrosion, apply a thin coat of grease on pad guiding surfaces. Use Optimoly HT (copper paste) or Plastilube. 5.Insert plugs in guide sleeves. 6.Engage housing retaining spring. Check that spring locates properly in hole. Do not use force to bend spring. 7.Insert warning contact: renew if necessary. 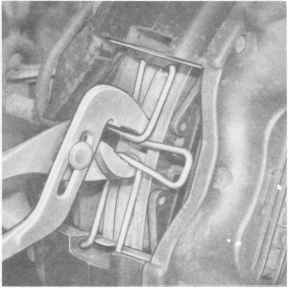 8.Press brake pedal several times so that piston and housing align brake pads with brake disk, or until clearance adjusts itself correctly. 9.Check level of brake fluid in reservoir, top up to MAX mark with fresh brake fluid if necessary. 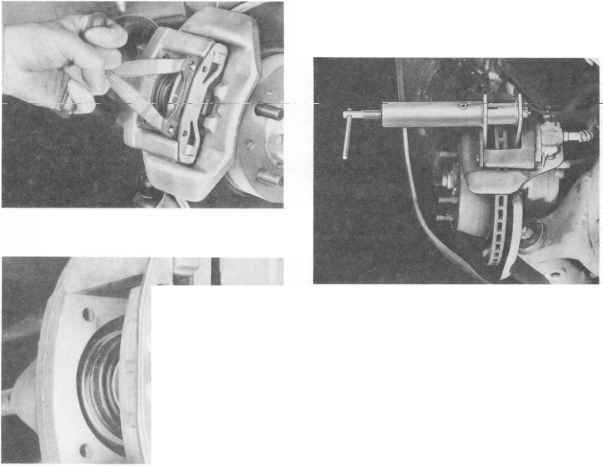 10.Check operation and efficiency of brakes, check system for leaks. New brake pads must be run in over the first 200 km. Only then are the friction and wear characteristics optimized. During the running-in period, severe braking from high speeds should be limited to emergency situations.